Mekertich Armen was a less known, even though well-regarded member of the generation of Armenian intellectuals that became victim of Stalinism. He was born Mekertich Harutiunian on December 27, 1906, in Alexandropol (nowadays Gumri), in a family of artisans. He studied in a local school and then in the gymnasium for boys and in one of the schools opened by the Near East Relief in the city. Years later, he would graduate from the State Institute of Cinematography in Moscow, where he studied at the section of script writing for two years. In 1922-1923 he was a boy scout (scoutism was still tolerated in Soviet Armenia in the early 1920s), and in 1923 published his first poem in the local newspaper Panvor . 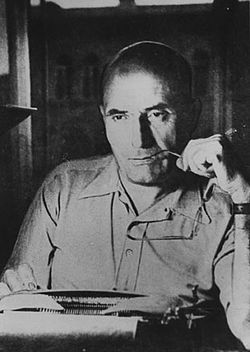 In 1925 Mekertich Armen was one of the founding members of the short-lived “October” union of writers of Leninakan (Gumri’s name in Soviet times), started by Gurgen Mahari (1903-1969) along with Soghomon Tarontsi (1904-1971), Gegham Sarian (1902-1976), Sarmen (1902-1980), and others. In 1925 he moved to Yerevan and entered another short-lived union of writers, called “November” and founded by Yeghishe Charents (1897-1937). He worked for a few years in the editorial offices of the journals Grakan Dirkerum and Yeritasard Bolshevik . He would also be the secretary of the artistic council of Haykino (the Armenian film studios, later known as Armenfilm). By 1934, when he became a member of the newly founded Writers Union of Armenia, Mekertich Armen had already published several books of prose, among them the novels Yerevan (1931) and Scout 89 (1933). His remarkable novel The Fountain of Heghnar (1935), set in pre-Soviet times, put him among the best writers of his generation. However, the political purges that swept the Soviet Union in 1936-1938 did not spare the political and intellectual class of Armenia. Along with many members of his generation (Charents, Axel Bakunts, Gurgen Mahari, Vagharshag Norents, Soghomon Tarontsi, among many others), Mekertich Armen was arrested in 1937 as an “enemy of the people” (the usual slogan of authoritarian and totalitarian regimes to tarnish its potential and real opponents) and exiled to a labor camp, where he remained until 1945. Upon surviving the hardships of exile, he returned to Yerevan and continued his literary activities. He published new novels and collections of short stories, but none repeated the success of The Fountain of Heghnar, which had been printed twice before his arrest and had three more editions from 1955 to 1961. In the short interlude of Nikita Khruschev’s period of the “thaw,” when the crimes of Stalin were denounced and some works reflecting the Siberian labor camps were allowed to be published, Armen published a collection of short stories, They Asked Me to Deliver to You (1964), that brought some recognition once again. In the last years of his life, he was named Emeritus Worker of Culture of Soviet Armenia (1967) and his collected works were published in five volumes (1967-1971). The Fountain of Heghnar was the subject of two films (“The Fountain of Heghnar,” Arman Manarian, 1971, Yerevan, and “The Spring,” Arby Ovanessian, 1972, Iran). Mekertich Armen passed away on December 22, 1972, in Yerevan.